All new grade nine students are invited to attend. Every year almost every grade nine student shows up to this orientation session. Led by senior students known as The Husky Pack, grade nines will experience their first high-impact school assembly, small group orientation to the school, a school tour, and a free BBQ where they will have a chance to meet their teachers. Grade nines will receive their timetables and registration packages, and will have time to find all their classes prior to the first day of school. The Senior Boys’ Football team faces KCI in this annual night game in October. This event is huge – over 900 fans attended last year! Hitch a ride to the game on one of our spirit buses with Huron swag. In 2016 we sent TEN spirit buses to the game!! The game also features a half time show from the HHSS and KCI dance teams (which team is better? ), concession food, commentary, and pump-up music. We also pair the event with a food drive – bring a food item to support the Food Bank of Waterloo Region. We have the best Halloween Week in Waterloo Region. The Leadership Class puts together a spooktacular series of events that feature a costume competition with big prizes (e.g. a limo ride to semi formal, a free student card + gym membership + yearbook, and more), a photo booth, and a pumpkin carving competition. Come in your costume solo, or co-ordinate your costume with a group and enter the group competition. Come out for a night of live rock and pop music from our talented musicians at Huron Heights. MYART auditions vocalists, guitar players, drummers, keyboardists, and even MCs to create this eclectic show. This is yet another Huron tradition that gets bigger every year! Each year the Business Leadership and Marketing students gather donations from the community for a very popular silent auction. Held in the school library, the auction is open to anyone in the school community. Hey, there are some great deals here! Best of all, money raised is given to a local family in need at our Holiday Assembly in December. 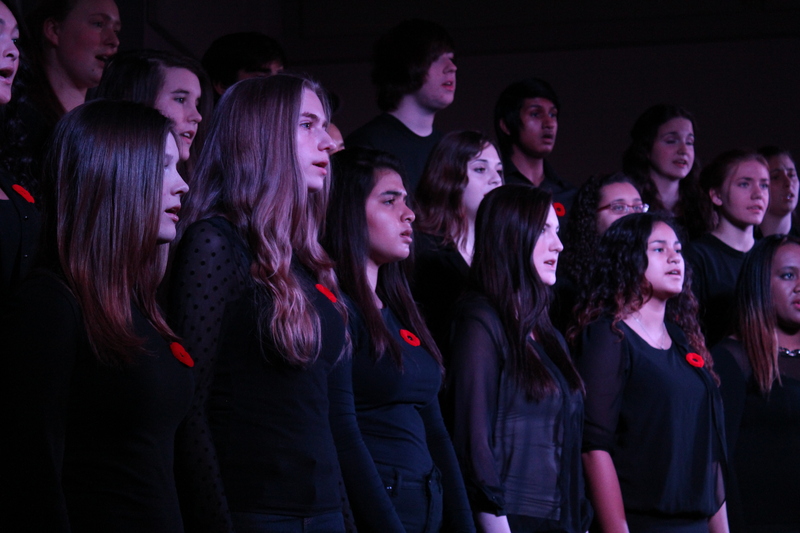 Our award winning choirs and bands perform for parents and the school community twice a year. Every year this event sells out to the point of being standing room only. Get your tickets early and support our music program. Dress to impress and join your friends at a club venue for this ever-popular dance. Every year this event sells out, with over 500 students attending. Past venues include Maxwell’s, Fed Hall, The Museum downtown, and Pearl. Some past themes include Fire & Ice, Casino Royale, A Night in New York, Winter Wonderland, Arabian Nights, Hollywood, and A Night in Paris. Look ‘up’ in the front foyer to see some of the amazing features Mr. Boyes and his team of construction students have created for semi formal. Attend with a date or with your group of friends. This dance is popular with every grade at Huron. We hold coffee houses once or twice per semester. This is a relaxed, low-key environment for students to share their artistic talents with their peers. Examples of performances include acoustic guitar & singing, piano & singing, instrumental solos, spoken word poetry, poetry readings, improv games, storytelling, and drama games. The low $2 cost covers treats, hot chocolate, tea, and coffee. This is the night every grad looks forward to. Dress your finest and celebrate the end of your high school career. This year’s prom is being held at Hacienda Sarria, a very classy venue. The cost includes a buffet meal, unlimited ‘mocktail’ drinks, a stellar DJ and light show, professional photography, and access to a beautiful garden for photos before the event.